MOSCOW, April 28. /ITAR-TASS/. The main stage unit of upper stage rocket Briz-M and two satellites — Kazakh telecommunications satellite KazSat-3 and Russian broadcasting satellite Luch-5V — launched from spaceport Baikonur on Monday has separated from booster Proton-M, Russian space agency Roscosmos press service told ITAR-TASS. 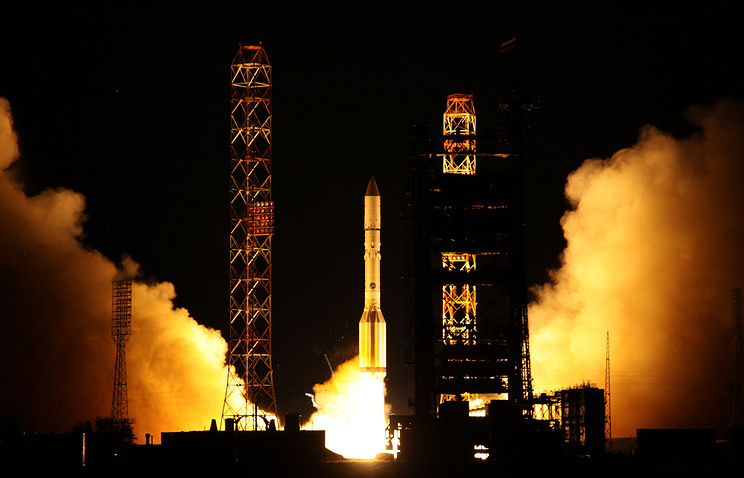 “Bringing of the Russian broadcasting satellite on pre-calculated orbit is due at 17:17 Moscow time (13:17 GMT), Kazakh telecommunications satellite at 17:57 Moscow time (13:57pm GMT) ,” the press service said. Broadcasting satellite Luch-5V is the third satellite of multifunctional broadcasting space system Luch, which is being created under the Russian federal space program in 2006-2015. Broadcasting system Luch is designed to provide telecommunications between the Russian segment of the International Space Station (ISS), low-orbit spacecrafts, launch vehicles and upper stage rockets and ground stations. Telecommunications satellite KazSat-3 is designed for services of telecommunications, television broadcasting and high-speed Internet access in Kazakhstan and neighboring countries. The spacecraft is developed and produced under the contract with the Kazakh space communications republican centre within the project of creating a republican national telecommunications and broadcasting space system.